Upon arriving at her aunts' home, Elly is instantly reunited with her childhood sweetheart, Anthony, who also lives in the building. As Elly makes herself at home, she begins to blossom and thrive under all the love she receives. However, ghosts and mysteries dwell in and around the Amore home, putting Elly and her fuzzy memory to the test as she embarks on learning more about her past. If I had to use one word to describe Palmieri's debut, it would be "magical." Everything about The Witch of Little Italy screams magic as you read it, and the more you read, the more mysterious and magical this book becomes. The novel is mainly told from the viewpoints of Elly and her aunt Itsy. Each chapter will tease you with just enough intrigue to keep you addicted until the denouement explodes into a very beautiful conclusion. Those with a prolific reading background will appreciate all the very seductive (and difficult-to-solve!) mysteries that make up The Witch of Little Italy. The witchcraft element in The Witch of Little Italy is done in good taste, and does not overshadow the book's core plot and message. Many elements in this novel remind me of The Secret Garden by Frances Hodgson Burnett - so if that's one of your childhood favorites, you're bound to love The Witch of Little Italy! This book is not without its secret passages and nostalgic childhood memories. Definitely one of the best novels I've read in the last year. If you like reading about families and witches, you may also want to try The Physick Book of Deliverance Dane by Katherine Howe, A Discovery of Witches by Deborah Harkness, The Witching Hour by Anne Rice, and Practical Magic by Alice Hoffman. 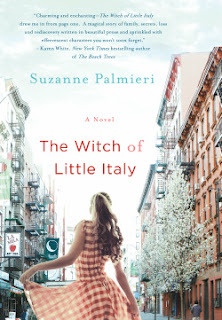 Did you read The Witch of Little Italy, and if so, what did you think? Also, what are your favorite books about witches? Share your thoughts with us in the comments section below.